Aunty Evelyn has always been my refuge. Growing up my family home was adjacent to that of my Aunt Evelyn and Uncle Freddy. Their yard was an extension of ours providing a shared space where we cousins played. For several summers during my boyhood, I’d go on vacation with Evelyn and Freddy’s family to Newfound Lake, N.H. There we created memories which have lasted a life time. A favorite is of hiking on a bluebird day, with my cousins Tom and Sandy, to the top of Mount Cardigan. We picked wild blueberries as we scrambled up and down that mountain. We returned famished to Evelyn’s chicken dumplings. Over the years I’d remind Aunt Evelyn of this memory and ask if she’d make me a batch of her famous chicken dumplings. Her response was always the same: “Kent, my dumplings can’t match the memory of you at age fourteen, having just climbed a mountain and digging in to those dumplings for the first time.” She’s right. Over the years Evelyn has provided me with a gift even greater than her chicken dumplings, the gift of unconditional love. Evelyn (and Freddy) were always there for me. They made a place for me in their home and in their hearts and for that I will always be grateful. In recent years I’ve moved back, from Oregon to Massachusetts, less than a few hours from where I grew up. We never lose the need to know we are loved. Loved without conditions. Aunty Evelyn has always offered me this gift. This love was my refuge as a boy and remains mine to this day. Garrison Keillor in his book, Lake Woebegone Days, writes: ‘The kindness we offer to a child is never forgotten.’ This is true. Now at age ninety-nine Evelyn looks back on her long life. She thinks of those no longer living: her husband, her siblings, friends. She’s grateful for her mother Anna, who taught her how to live with courage and a selfless spirit. Evelyn chooses to look back with gratitude and a sense of wonder at how her life has unfolded. And, she chooses to live in the present with a sense of gratitude too. Grateful for the gift of her friends and especially her family. 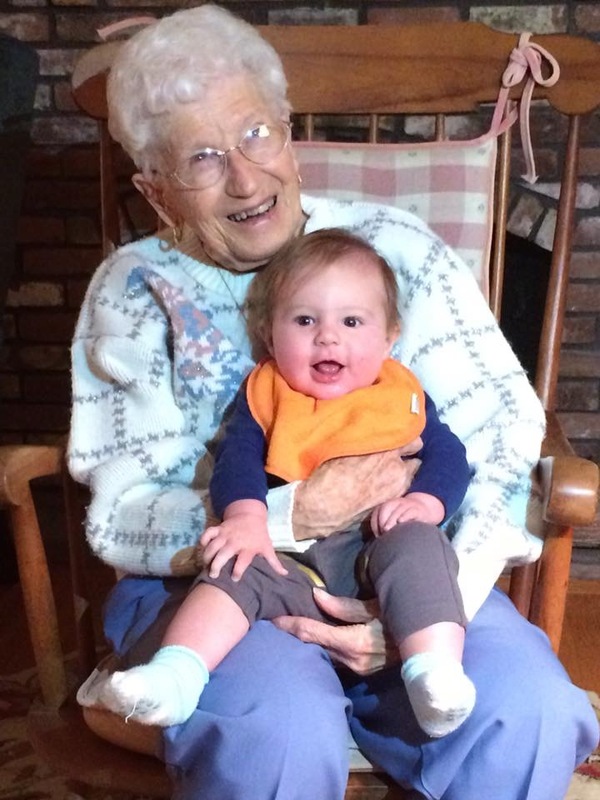 Evelyn on her 99th birthday with her Great-granddaughter, Riley. Recently the family gathered for her birthday. A few days later a group of friends baked her a cake and presented her with flowers. When I grow up, I want to be like my Aunt Evelyn. I want to live my life loving those around me unconditionally. I want to learn to focus not on what I’ve lost but on what I have. I too want to offer kindness and accept with gratitude the kindness of others. I want to live with as much grace as Evelyn Wisz Harrop. Thank you Aunty Evelyn. You’re the best. Heart warming! What a beautiful tribute. What a beautiful aunt and story. Thanks for sharing this positive ray of sunshine!